Made more progress today – I dug out my copy of “Birds of North America” to find flight profiles of some local birds which I used to create a couple of birds (remember I needed them to cover dark spots in the sky). 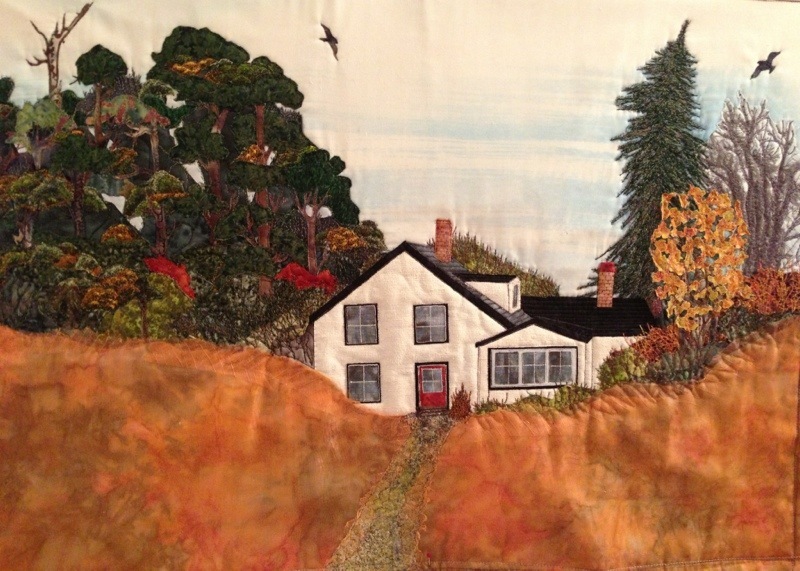 I started stitching the trees on the left – the tree trunks, the foliage – realized I should have removed much more of the green underlay Friday night when I was taking all that stitching out! At the moment you can see the tree trunks close up, but they don’t show from a distance because they’re lost against that dark green underly. They need something to give them texture (not thread painting, I don’t think – although I’ll try a sample), in the end I may just live with what I have – this, after all is a learning experience. Tomorrow – gotta tackle the asparagus field itself. Those trees are looking great now. Love the birds too.